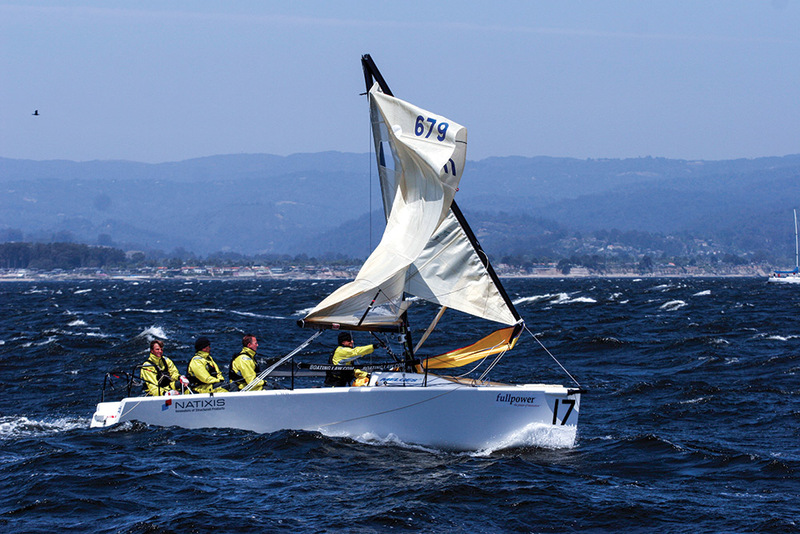 Most of the time, sailing is no more risky than other outdoor pursuits, but when something goes wrong the situation can get serious very quickly. The secret to dealing with emergencies is to have a plan of what to do when the worst happens but not allow it to take away from enjoying sailing. “You need to have this stuff floating around in your brain, but not allow it to rule your life,” said John Kretschmer, who has sailed hundreds of thousands of miles on countless boats as a delivery and sail-training skipper. Regardless of the scenario with which a sailor is faced, the approach to it can determine the outcome. And the first step when anything goes wrong is to avoid a panicked approach, Kretschmer said. “You have to prevent having everyone running around like crazy,” he said. “Everyone should have a position. It’s when there is a breakdown in command that bad things happen. The skipper has to know her stuff so you don’t panic. You can almost always get these things under control.” During his sail-training passages Kretschmer gives every member of the crew an assignment in the case of an emergency. As the skipper, it is his call when a situation warrants emergency action and he tells the crew that when he announces that everyone needs to go to their positions, it’s time to get serious. Kretschmer also advises sailors to simply, “Think like a sailor.” In other words, think a few steps ahead and have situational awareness of what is going on around the boat. For instance, if you’re powering into a harbor, know where the wind is coming from. “Just because you turn the motor on doesn’t mean you turn your brain off,” he said. “Know that if the engine died you would need to go another 100 feet and then turn into the wind to avoid a breakwall. Make sure the anchor is somewhat ready to run. Just having thought about these things puts you in a different place in your brain when a crisis occurs than if you hadn’t thought about it all.” And that’s what can make the difference in managing a crisis. “So much of real crisis management comes down to how you react immediately,” he said. “You can put off an escalating situation if you make those first two minutes count. Think like a sailor without being a paranoid maniac.” Worst-case scenarios generally refer to situations when there is the potential for a loss of life. In addition to a man overboard situation, which has been covered in other articles (available on sailingmagazine.net), these are scenarios no sailor wants to face, but having a general plan may make the difference between a narrow escape and a tragedy. It’s unlikely that losing a rudder would fit the criteria of a situation that could lead to a loss of life, but it is certainly qualifies as a bad onboard scenario, and it’s all about seamanship. If the rudder breaks or falls off, the boat will round up, so you’ll be more or less head to wind with everything flapping. First, get the sails situated and then start devising alternate steering methods. Some boats carry emergency rudders, but most likely you’ll be devising a makeshift rudder. This can be a floorboard or door lashed on the spinnaker pole which is then lashed off the transom sticking out behind the boat, or it could be dragging something behind the boat. Buckets, sail bags or a drogue with lines leading to winches can be adjusted to create drag that offers steerage. You’ll need to get a little creative, but you’ll manage to pull something together to sail on. It doesn’t take a pro to know that there is a lot you can do to avoid losing a rig. Making sure that all of the rig’s components are in good shape, cotter pins are in place and that you don’t unnecessarily overload the rig can go a long way to preventing disaster. But accidents happen and masts do fall down. As soon as a mast falls down it becomes your enemy and the goal becomes making sure that it doesn’t damage the hull. A section of mast flailing around in rough seas can become uncontrollable. 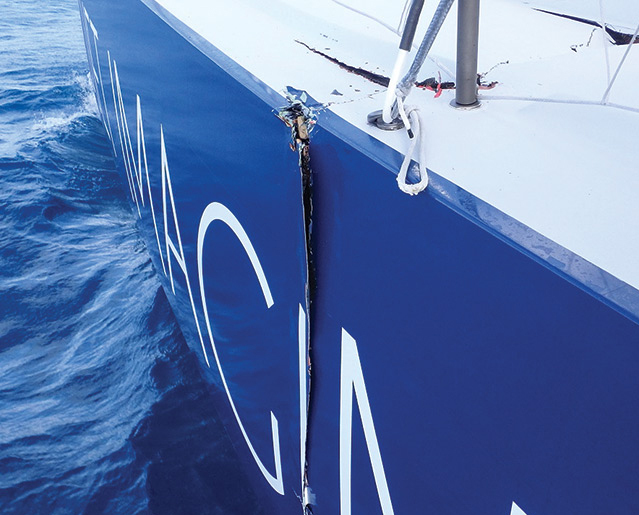 Fenders can help protect the hull and if possible, bring the broken mast section alongside the hull so it is parallel to the boat and has less chance of holing the hull. If you want to retrieve the broken mast section if possible because it can be handy when creating a jury rig and you don’t want to create a hazard for other boaters, but not at the expense of damaging the boat or injuring crew. How easily the rig is cut away depends entirely on the equipment you have on board, and Kretschmer said he believes in having several very sharp hacksaw blades on hand for cutting rod rigging and quickly getting rid of cotter pins. “Most bolt cutters aren’t going to do anything, especially when they are dull and buried at the bottom of a drawer somewhere,” he said. “I think I could make eight cuts with a sharp hacksaw and have a rig free in minutes.” Keep in mind that rigs break differently depending on what they are made of. Carbon fiber rigs can shatter at the breaking point, littering the deck with thousands of carbon fiber slivers. Crews should wear gloves when possible to avoid injury. When the mast has been cut away and the immediate danger has passed, start working on a jury rig. What you can come up with depends on what you’re left with and each jury rig will be different, but spinnaker and whisker poles, storm sails and small jibs can all be incorporated. Most sailors agree that of all the things that can go wrong on a sailboat, a fire is perhaps the scariest and most serious. 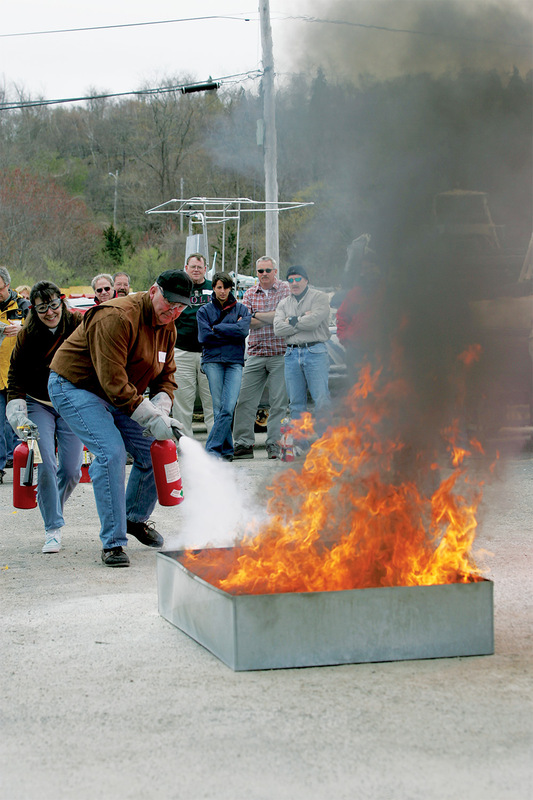 And it’s no surprise that preparation is especially important regarding fire emergencies. Fire extinguishers—Kretschmer carries 13 of them on his 53-foot Quetzal—and perhaps a fire blanket are requirements. In his decades of sailing, Kretschmer said he has only fought an onboard fire once, and he learned a valuable lesson from it. When he smelled something burning in the engine compartment, he opened it to inspect it. Introducing oxygen to the smoldering fire caused it to ignite and the situation quickly became an emergency. Fortunately there were several fire extinguishers handy and Kretschmer and the crew were able to quickly put the fire out. Most fires on boats do not start in the galley, where the stove is typically supervised any time it’s on. It is far more likely that a fire will start in the engine or in an electrical panel. Most engine compartments have small ports large enough to shoot a fire extinguisher through without opening up the compartment, avoiding the mistake Kretschmer made years ago. On Kretschmer’s boat, in the case of a fire, the plan is for Kretschmer to work on extinguishing it with the help of one other person who can fetch additional extinguishers. Another person is in charge of helming the boat. Other crew gather safety gear including a ditch bag, EPIRB, water and other items in case the crew would need to get in a life raft. And a radio operator can make a pan-pan call advising nearby mariners that there is a potential emergency onboard along with a position. Kretschmer recommends that sailors take a basic firefighting course, even one geared toward fires on land. It’s important to know how to use a fire extinguisher. You want to point it at the base of the fire or even slightly behind it, not at the flames. Collisions at sea are more common now than ever before. Several boats in the around-the-world Vendée Globe race were disabled when they hit so-called unidentified floating objects and cruisers report hits and near misses regularly. Often these collisions involve submerged shipping containers that have fallen from ships, but occasionally whales or something unknown is to blame. Whatever the case, collisions are typically violent stops with the potential for onboard injury and significant damage to the boat. If the boat has been holed and there is water coming in, the first thing to do is to heel the boat hard on the other tack, Kretschmer said. If the boat has been holed, the goal is to stop the influx of water. Do whatever you can to plug the hole. Buckets, cushions, clothing, foam life jackets and many other objects typically found on board can be used. If the hole is large, you can attempt to use a small jib or storm sail as a skin around the hull of the boat by wrapping it from the bow or stern. While some of the crew work on slowing the influx of water, others need to be working on removing water. Other crew should take their positions gathering items in case of having to get in the life raft, calling on the radio and controlling the boat. Sometimes water enters the boat through something other than a holing. There are typical places where water can enter: through the stuffing box, the through-hulls, broken hoses and siphoning bilge pumps. Sailors should know the location of seacocks and through hulls on the boat. In the case of leaks other than holing, the cause can usually be located with systematic check of all these typical locations. Come and join the discussion on our message board. You can chat with other members and get the latest news on upcoming events. Register for VSC's Monthly News eMail for access to our discussion blog, latest events, NEW Courses & Cruises and last moment deals on sailing education and cruising. Sechelt - "A Calculated Assessment of Heavy Weather Sailing"
Click HERE to visit the NauticEd Sailing School Network page. Sechelt Inlet - "A Calculated Assessment of Heavy Weather Sailing"
@metaspoon I wonder if she sails? Copyright © 2019 Vancouver Sailing Club. All Rights Reserved.